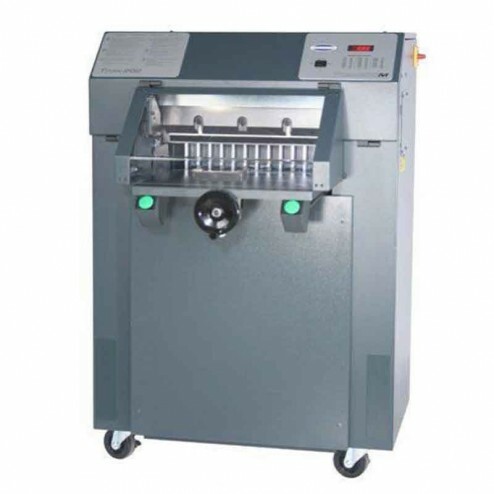 The Challenge Titan 200BC Hydraulic Power 20" Paper Cutter saves time and money. The Titan 200BC is a version of the popular 200 model. The heavy duty casters make the 200BC portable. The LED bright cut line indicates exactly where the cutting blade will come down, so paper alignment and repositioning has never been simpler. The 3/4 HP, Single-Phase motor only runs when cutting, making this machine energy efficient. Dimensions WxLxH:36" x 50 7/8" x 52 1/4"
Standard: ¾ H.P., Single-Phase, AC, 60 Hz, 120 Volt, 12 Amps, Service size 15 Amps. Power cord included. Requires Receptacle Type: NEMA 5-15R Optional: 1-½ H.P., Single-Phase, AC, 60 Hz, 208/230 Volts,12 Amps, Service size 15 Amps. Power cord included.Requires Receptacle Type: NEMA 6-15R or 6-20R. Included: (1) standard knife, (3) plastic cutting sticks, (1) jogging aid, (1) manual, (1)tool kit, & (1) knife change safety holder assembly& (1) knife change safety holder assembly.